The Doppler effect refers to a shift in frequency perceived by an object in motion relative to the source of a wave. When applying this to ultrasonography, the transducer is a stationary source of ultrasound waves of a known frequency (depending on the mode) and velocity (1540 meters/second) which reflect off tissues, and specifically for doppler ultrasound, red blood cells (RBCs). Many of these sound waves are scattered in all directions, some are absorbed by tissues, and some of them are even dissipated as heat. The waves that are reflected back to the ultrasound transducer are used to construct the image. 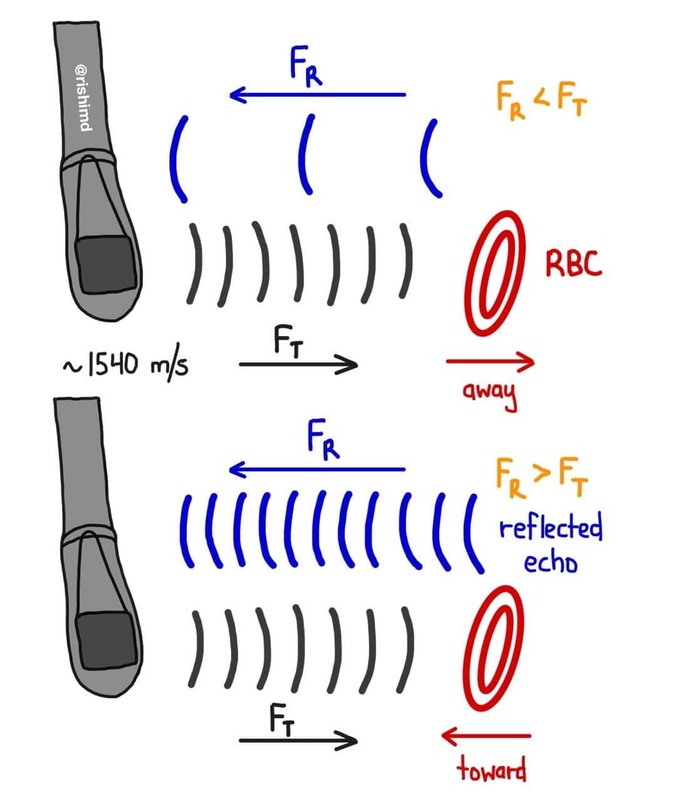 Because the RBCs have velocities with vectors moving to and away from the transducer, a “doppler shift” is created as the reflected frequency (FR) changes relative to a fixed transmitted frequency (FT). If the RBC is moving away from the source, FR is less than FT. If the RBC is moving toward the source, FR is greater than FT. Velocities of different magnitudes (ie, fast moving blood, slow moving blood) and directions (toward the probe, away from the probe) are often times color coded on color flow doppler (CFD).